The February jobs report released Friday showed the unemployment rate at 7.7 percent, its lowest level in four years. Job gains were better than expected in the last snapshot of the job market before the federal spending sequester began on March 1. Employment rose for college graduates as it did for most people — but not fast enough to keep up with growth in the college-educated work force, leaving this group with a slight net rise in unemployment. 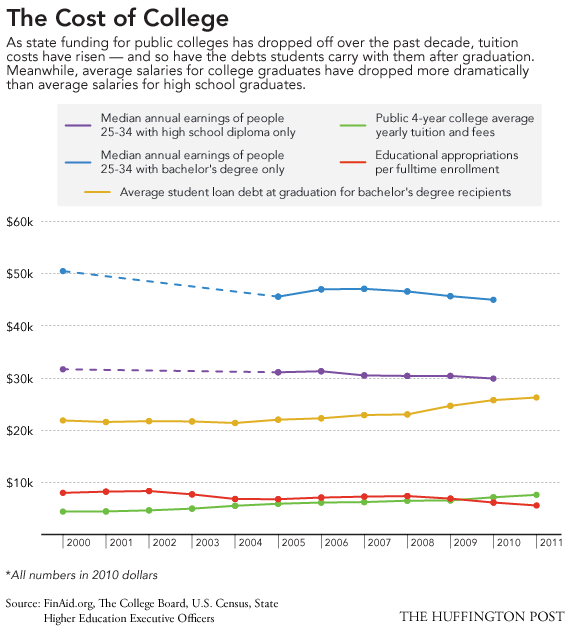 College students and graduates have watched debt levels and tuition costs rise during the recession as they reach into their own pockets to make up for reduced state educational appropriations that used to cover most of the cost of public four-year colleges. A shifting and squeezed job market has left about half of recent college graduates unemployed or working jobs that don't require a degree, making it even harder for them to pay back their loans. The only type of household debt that has grown during the recession is student loan debt, which has snowballed into a trillion-dollar bubble as more and more students take on larger debts and many default on their loans. As student debt keeps breaking records, states have continued to cut back in support for public higher education, driving the cost of college up with no sign of relief in sight. And for everyone with federal student loans, the harsh budget cuts of the sequester will raise the cost of borrowing. They could cost some of the most needy students hundreds of dollars a year in fewer work-study hours, reduced aid and new fees, according to the Student Aid Alliance. Pell grants are exempt from the cuts this year but not protected going forward. College may be getting even more expensive, especially for students who can least afford it.